Toph is a professional Melee Fox player from Honolulu County, Hawaii who currently resides in Daly City, California. He is currently ranked 20th on the NorCal Melee Power Rankings and was formerly ranked 97th on the 2015 SSBMRank. He is mostly known for being a commentator, with his static commentating partner being Scar. Toph is fluent in Japanese, and he helped to provide Japanese commentary for the Top 8 of Melee at Apex 2014 alongside Kounotori on CLASH Tournaments's live stream. He also speaks Japanese for interviews. Toph was also invited to participate in the E3 2014-held Super Smash Bros. Invitational tournament to play Super Smash Bros. for Wii U, in which he used Pit. Toph and Scar appeared as commentators in Nintendo's Smash 4 event at San Diego Comic Con. The two also commentated together for the Top 8 bracket at EVO 2015, EVO 2016, The Big House 4, The Big House 5, and The Big House 6. He is also a co-host of the Scar and Toph Show, where the two discuss the state of the community and other topics. Since April of 2017, Toph has hosted (along with Scar) The Reads, produced by Cross Counter TV. On this show, Toph and Scar have a different guest every month, and they release 4 consecutive episodes weekly. 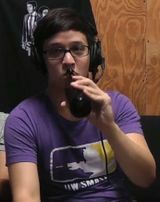 On September 8th, 2015, Toph was hired by Twitch as another representative of the Smash community, along with Scar, D1, and TheCrimsonBlur. Toph is also a top Catherine player. He notably placed 2nd at EVO 2016, 3rd at GENESIS 4, and 5th at CEOtaku. This page was last edited on April 20, 2019, at 05:48.